Young children are curious and get into ordinary household items that have the potential to hurt or even kill them. 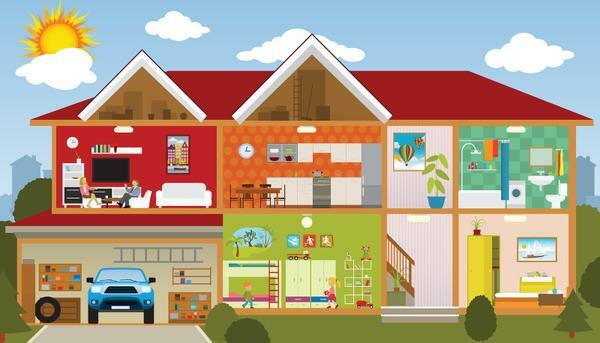 This factsheet is designed to help you identify potential hazards in your home. Then follow take the simple, low-cost actions steps suggested to keep your children safe from everyday dangers in you home. Keep your floors clear of anything that may cause tripping. Repair any stairs that are cracked or worn. If there are rugs in your home, use non-skid mats and throw rugs. When carrying large or heavy loads, make sure you can see where you’re going. Ask for help if you need it. Keep your home well lit so that you can see where you’re walking at night. Wear shoes with non-skid soles and put young children in non-skid socks. Teach your children not to run indoors or jump down stairs. Kitchen – Your kitchen is one of the most dangerous places for a child. Drain openers, detergents, oven cleaners, and other cleaners can hurt you and your children. Put safety latches on all cabinets and drawers with harmful products. Even better, put them in a place that children can’t reach. Children often get into dangerous products while someone is using them. If you can, keep your children out of the room while you’re cleaning. Bathroom – Things in your medicine chest – like medicine, makeup, mouthwash, first aid supplies, deodorants and cleaners – can hurt children. Keep these out of their reach. Put a safety latch on your medicine chest. Bedroom – Keep medicine, medications, perfumes, makeup, and cigarettes out of children’s reach. Living Room – Things to look for in the living room are: liquor, cigarettes, furniture polish, lamp oil, and some plants. Keep these out of reach. Garage, Basement, and Laundry Room – These are some of the most dangerous places in your home. There are lots of chemicals and poisons in them that can hurt or kill a child: bleach, antifreeze, gasoline, kerosene, car polishes, car batteries, paints, paint removers, mothballs, bug spray, road salt, and more. It’s safest to keep children out of these places all together. Put in a smoke alarm on every floor of your home in or near every sleeping area. This will cut in half the chances of someone dying in a fire. Store matches, lighters, and other heat sources in a safe place like a locked drawer will help keep your children from playing with them. Don’t let children play near the stove or grill either. Playing with fire – matches, lighters, stoves, or heaters – is the leading cause of fire related death for children five and under. Teach your children how to prevent fires, and what to do if there is a fire. Talk about fire safety with your children. Your local fire department can help. Plan and practice a fire escape route with your family. Do this at night with the lights off so you’ll be ready if there is a fire. Keep all space heaters out of doorways, halls, or other busy areas. Space heaters cause most burns at home. Also, keep them at least three feet from curtains, bedding, or other things that could catch fire. Put up a barrier to keep children and pets away from heaters, and teach children that heaters will burn. Do not give young children foods such as hot dogs, nuts, popcorn, and hard candy. These common foods can easily get stuck in a small child’s throat and cause them to choke. Sit your child up to drink. Even drinks like formula, milk, or juice can make babies choke if they drink them laying down. Do not let your children play with balloons. Other household items that can problems for young children include coins, marbles, and buttons. Keep your floor picked up. Do not allow children to play near cars or old appliances. They can suffocate and die if they become trapped in a car trunk or old refrigerator. Keep children away from suffocation and choking hazards. Young children can get tangled up and suffocate in curtains, window blind cords, and extension cords. Plastic bags and covers are also dangerous. Don’t tie toys or pacifiers to children’s clothes. Very small children should not wear jewelry around their necks. Read packaging on all toys to make certain it is safe for you child. Toys with small parts or long cords may strangle or cause a child under the age of 4 to choke. If you have or use a pool – watch children under the age of 12 at all times around pools. Make sure they walk on the pool deck. All pools, hot tubs, and spas should have a fence at least 5 feet high, with a self-closing, self-latching gate around them. It’s important that this fence be one that children cannot climb. Don’t think of your home as part of the fence, because children can open doors to get to a pool. Take all toys out of the pool area after swimming so children won’t go back into the water and play by themselves. Children should wear life jackets or vests while on docks or at beaches or rivers. Never let a child swim alone! Never leave a young child alone in the bathtub. Children can drown in only a couple inches of water. Older children and adults should learn first aid and CPR so they can help if someone gets hurt. Never let children ride on equipment such as lawn tractors. They may get hurt if they fall off. Get safety gear like helmets and kneepads for children riding bicycles, scooters, in-line skates, ATVs, and skateboards. Set a good example by using safety gear yourself. Store guns safely – unloaded and locked up. When traveling by car, make sure that children under 12 ride in the back seat. Use car seats for infants and toddlers under 40 pounds. Use booster seats for children until they are 8 years old.